You have probably noticed quite a bit of chatter in the news lately about “off label” use of prescription medication for weight loss and wondered what all the fuss is about. Is it safe? Where can I find a doctor who really knows about this topic? You have come to the right place! Robert Skversky MD has devoted the past 18 years of his medical practice strictly to treating the overweight patient and is often called upon by the media as an authority on the subject. 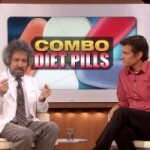 In March, he appeared on the Dr. Oz Show to describe his use of some off label medications, such as Topamax, in combination with more commonly used weight loss medications in his Southern California practice. Earlier this year, he was interviewed for a story on Combination Drug Therapy in MORE magazine. Check out the Video Gallery, to view clips of Dr. Skversky’s appearances on the Dr. Oz Show, The TODAY Show, The Early Show, Good Morning America and much more.